IMDB's 6.0 is rather harsh. Granted, it's contrived and cheesy and heavy-handed, but pleasantly so! 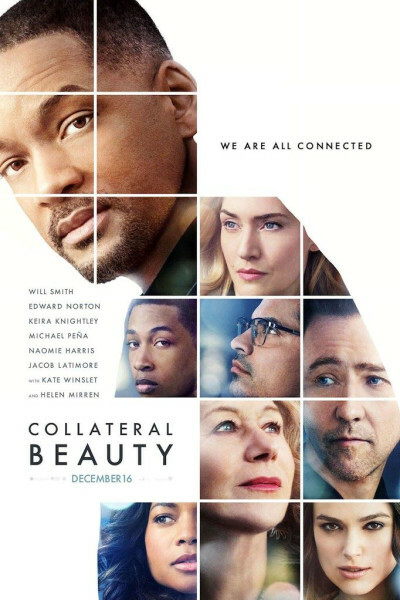 Unfortunately, moviegoers are not going: after seven days, Collateral Beauty sits at $15M USD. That's Will Smith's worst opening ever. My take on it is that Time, Love, and Death are interesting organizing principles for a film, but I am skeptical they are the organizing principles for a film, even this one. Grief, for example, and Anger and Bitterness seem to animate most of Smith's behavior. Fortunately, as expected, his character is but one of five whose lives are resurrected following some twisty and surprisingly unexpected turns. If you fancy yourself a gentle and tolerant critic—the sort who enjoys It's a Wonderful Life, accepting it for what it is rather than scoffing at it—I think you can sufficiently suspend your disbelief for an hour and thirty-seven minutes and enjoy Collateral Beauty as a 'feeling,' the one we each experience following loss. Agreeing to that, the film can survive. Just don't expect any delicate machinations, any deft touches, because what you will encounter—instead—is an iron skillet to the tip of your nose. It's that level of subtlety. Which, frankly, is fine by me. After all, it's Christmas for cryin' out loud! The season of excess, overindulgence, and ham.